For those who want to look good, there's no dearth of facials, face packs, creams, lotions and a wide range of cosmetics. However, people seldom realize that looking youthful is as much as about nutrition, as it is about beauty products. A number of nutrients are needed for a healthy, glowing skin such as fats, protein, and various vitamins. Of these, most people are generally not aware about the important role played by protein in skin health. The thing that makes skin soft, supple and elastic is collagen, which can be described as the skin's cement. Collagen is made from fibrous protein, which is why you need to have adequate portions of protein in your diet if you want youthful, radiant skin. At the bloggers meet organized by DuPont Nutrition & Health, we were informed about the importance of protein in our diet. We learned that Soy Protein is a top quality plant-based protein and it can be used to fulfill the Recommended Dietary Allowance (RDA) of 0.8 grams of protein for every kilogram of body weight. Soy Protein can work wonders for your skin, as it has all the nine essential amino acids, making it as good as protein derived from milk, eggs and meat. Another advantage is that Soy Protein does not have cholesterol and fats, so you do not have to worry about gaining weight. In addition to making your skin look younger and radiant, Soy Protein can also help you fight protein deficiency in hair and nails. For bouncier, shining hair and healthy nails, you will need good quality protein such as Soy Protein. Hair and nails are largely made from proteins, which is why protein supplementation is necessary. If you have issues such as hair fall, split ends, dull hair, thin hair, brittle nails, cracked nails, etc., it may indicate a protein deficiency. Supplementing your diet with good quality protein such as Soy Protein can help you overcome such problems. Protein deficiency is also one of the reasons for puffy bags and dark circles under the eyes. Here too, supplementation with good quality protein can be useful. At the bloggers meet organized by DuPont Nutrition & Health, we learned about various other benefits of Soy Protein. We got to know that it is easily digestible, which makes it appropriate for everyone including kids and elderly. It helps in weight loss and weight management, as it gives a feeling of satiety. 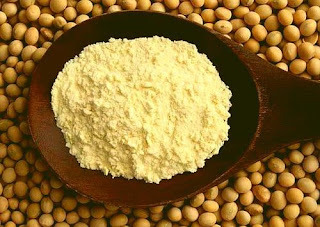 Soy Protein is important for muscle growth and repair, even more so for people undergoing resistance/strength training. It prevents muscle loss among the elderly, allowing them to live a healthy, active and independent life. Soy Protein is also beneficial for heart health, as it has cholesterol-lowering properties. If you want to look good and stay healthy, including Soy Protein in your diet can work as an effective solution. Soy Protein is derived from natural plant-based sources and it is completely safe for long-term use. It has been approved by the Food and Drug Administration (FDA) in US and regulators in various other countries.